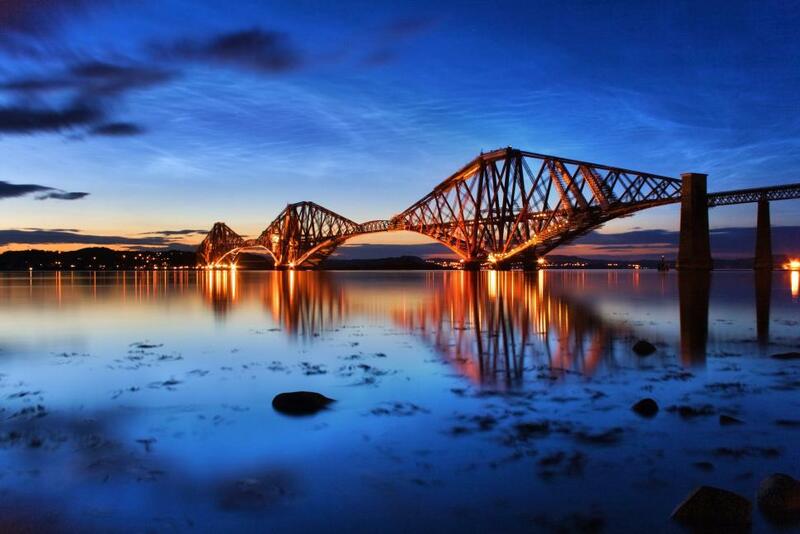 The magnificent Forth Bridge is a World Heritage Site and one of the most iconic images of Scotland. 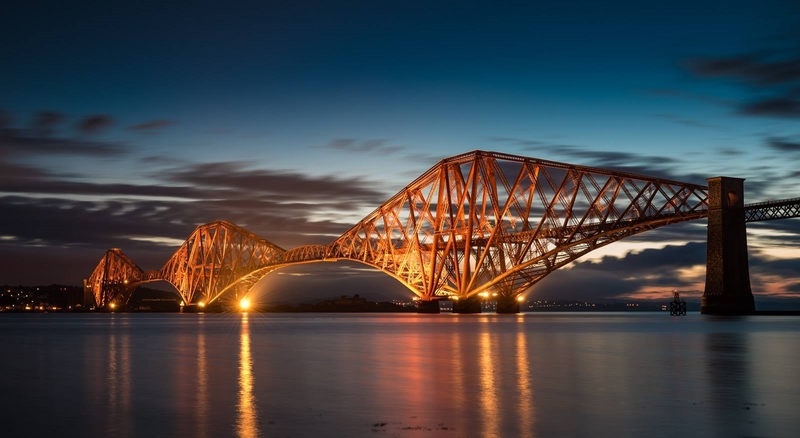 In early 2014 an application was submitted to UNESCO in an attempt to have the Forth Bridge inscribed as a World Heritage Site and this was granted on 5 July 2015. 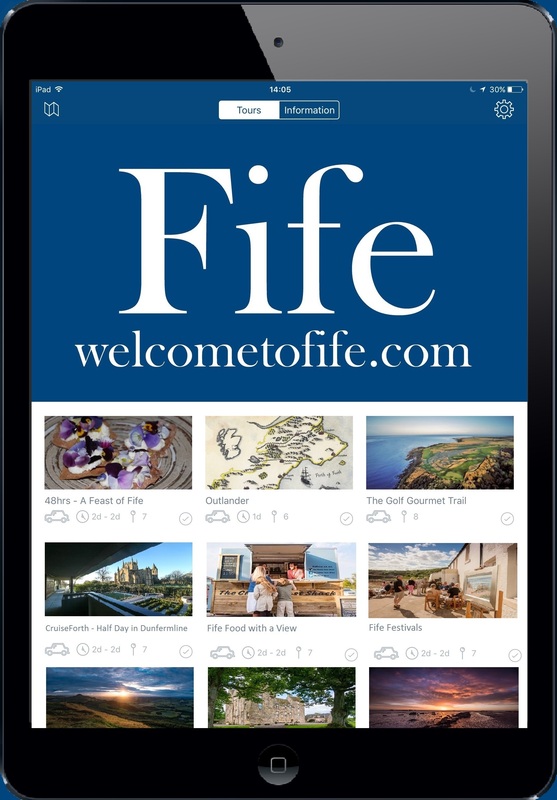 The Forth Bridge joins The Old and New Towns of Edinburgh, New Lanark, St Kilda, the Antonine Wall and The Heart of Neolithic Orkney as Scotland's sixth World Heritage Site. It was opened on 4 March 1890 by the Prince of Wales (who became King Edward VII). By way of marking the occasion, he hammered in the last rivet, which was duly gold plated. The bridge connects Scotland's capital city, Edinburgh (at Dalmeny), with Fife (at North Queensferry). Sir John Fowler and Sir Benjamin Baker designed the structure that was built by Glasgow based company Sir William Arrol & Co. Baker and his colleague Allan Stewart received the major credit for the design and overseeing the building work. 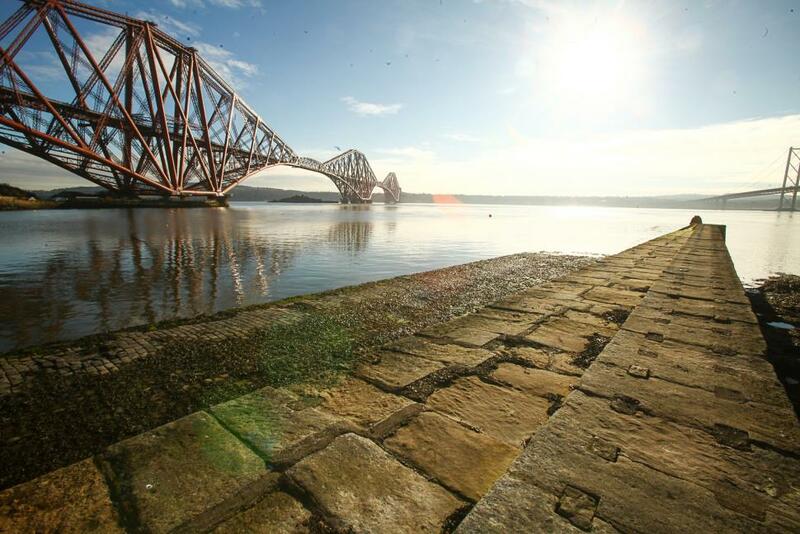 The bridge was the first major structure in Britain to be constructed of steel. By comparison, its contemporary the Eiffel Tower was built of wrought iron. At the time of its building, the Forth Bridge had the longest single cantilever bridge span in the world, at 2,528.7 metres (8,296 ft). It's now been overtaken by just one bridge, the Quebec Bridge in 1917. The use of a cantilever in bridge design was not a new idea, but the scale of Baker's undertaking had never been seen before. A cantilever bridge is a bridge built using structures that project horizontally into space, supported only on one end. Large cantilever bridges are designed to handle road or rail traffic using trusses built from structural steel, or box girders built from prestressed concrete. Much of the work done was without precedent, including calculations for incidence of erection stresses (the internal forces exerted on structural members during construction), calculations for wind pressures and the effect of temperature stresses on the structure. These days modern trains put fewer stresses on the bridge than the earlier steam trains, however the bridge still needs constant maintenance. Up to 200 trains cross the bridge per day, and they must travel within speed limits of 50 miles per hour (80 km/h) for passenger trains and 20 miles per hour (32 km/h) for freight trains. The weight limit for any train on the bridge is 1,422 tonnes. 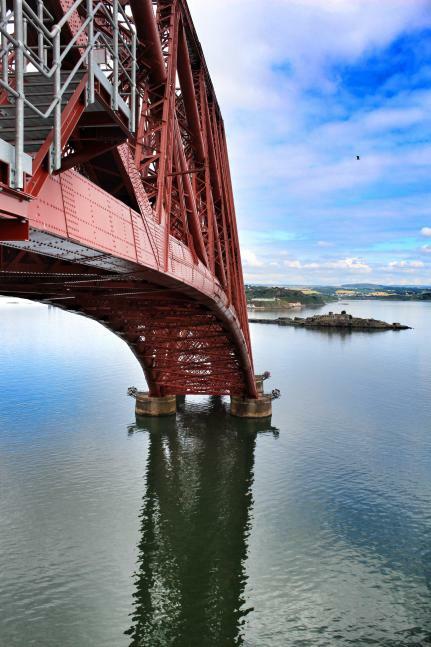 The Collins Encyclopaedia of Scotland describes the Forth Bridge as 'the one immediately and internationally recognised Scottish landmark'. 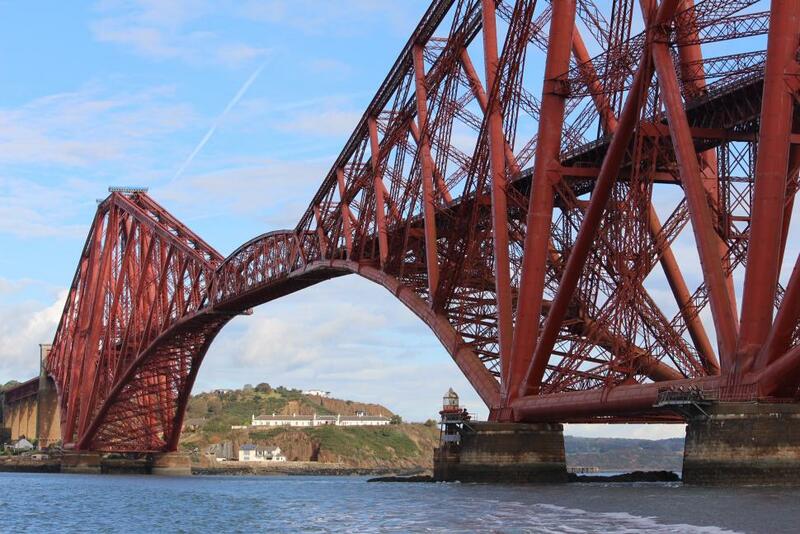 The expression 'painting the Forth Bridge' is often used as a metaphor for a never-ending task because many believe that at one time the repainting of the bridge started immediately after completion of the previous repaint. This is not true, however and it has been confirmed that such a practice never actually existed. The bridge features in Alfred Hitchcock's 1935 film The 39 Steps and again (even more prominently) in the 1959 remake. 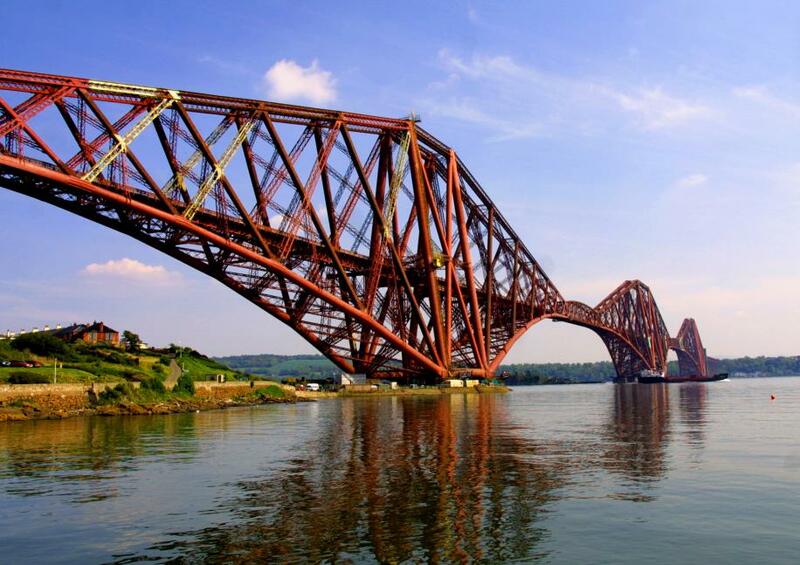 The closest railway stations to the Forth bridges are North Queensferry on the Fife side of the Forth and Dalmeny (serving South Queensferry) to the south of the Forth Bridge. First ScotRail services stop at these stations and take approximately 20 minutes from Edinburgh Waverley and about 15 minutes from Dunfermline Town. There are reduced services in evenings and on weekends.